Custom full color crack & peel stickers or labels. Various sizes and paper options. Full Color Printing on 60lb paper label stock. Available in Glossy or uncoated (easy to write on) finish. The backing has crack and peel for easy application. Order any size from 2x2 to 11x17 inches. Full Color Printing on 4 mil Vinyl label stock. Durable and waterproof. Order any size from 2x2 to 11x17 inches. Custom Stickers kiss cut to Any Shape on White or Clear Vinyl. Printed on durable vinyl with easy peel off backing. Common shapes are like circle, Cloud, Leaf , Oblong and more. Sticker Sheets are great giveaways and is great for branding. Use it to group all your collections into one sheet and then hand it out. Any Shape Decals, printed full color on durable vinyl and laminated for added durability. Custom Printed Bumper Sticker available in rectangle shape or any custom shape you want. Printed full color on durable vinyl material. 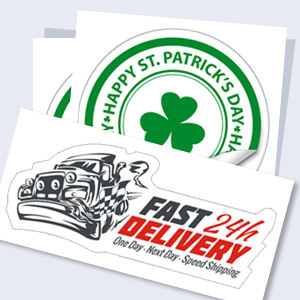 Choose from clear sticker, static cling, perforated vinyl and more. Available in any size and shape. Printed in full color on anti-slip media and can be used indoor on almost all surfaces including tiles, marble, concrete, linoleum, porcelain, vinyl.